Are you looking for the best wireless printer to print photos from your iPhone or any other smartphone? The easiest way to print photos from iPad, Android phone or iPhone is to use a perfect wireless printer. What is the most desirable feature for a Wi-Fi printer? Is it portability and compactness? With a wireless printer, you can print without a USB connection and can directly print from your mobile device. The printer is designed to work well with all series of iPhone (including iPhone5), tablets, android phones and iPads. You can plug in the printer to any type of AC outlet. 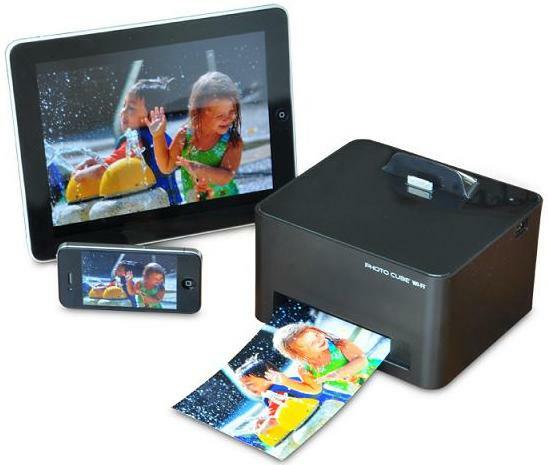 The Photo Cube wireless printer comes with a power cord, AC adapter, photo cartridge and trial ink. Easy and hassle-free photo printing without any wires. No need of a computer to print photos. Can also print from your digital camera using the PictBridge built-in feature. It is compatible with all versions of android tablets and phones. Can download the free App from Google Play or App Store.